Aim: The aim of this study is to evaluate the bactericidal effect of 908 nm diode laser in conjunction with various irrigation regimes in disinfection of apical third of root dentin. Materials and Methods: Sixty prepared teeth with single canals were contaminated with Enterococcus faecalis. The specimens were divided into 6 groups (n = 10): Group 1 and 3 and 5 were subjected to chemo-mechanical preparation using 5.25% sodium hypochlorite (NaOCl), 17% Ethylenediaminetetraacetic acid (EDTA); 1.3% NaOCl, MTAD (mixture of doxycycline, citric acid and a detergent (Tween 80); and, 8.5% saline, respectively followed by 908 nm diode laser irradiation; Group 2 and 4, followed the same procedure as Group1 and 3, however without laser irradiation; and, Group 6, rinsed with saline solution (control). Dentin shavings from apical third were analyzed for the presence of E. faecalis using culture method and Polymerase Chain reaction (PCR). Results: One-way Analysis of variance showed statistically significant differences between the laser irradiated groups, non irradiated groups and the control group. Conclusion: 908 nm diode used in conjunction with conventional chemomechanical techniques demonstrated a significant elimination of E. faecalis in the apical third of root dentin. Traditionally, endodontic bacteria have been studied by means of culture-based techniques. In the past decade, a major shift has occurred in oral microbiology towards microbial molecular techniques like polymerase chain reaction (PCR), which are more specific, sensitive, and more accurate and rapid than culture, and can detect uncultivable and fastidious microorganisms. Hence, the aim of this study is to evaluate the efficacy of 908 nm diode laser irradiation in conjunction with different intracanal irrigants in the disinfection of the apical third of the root dentin, using culture and PCR methods. Sixty extracted single rooted maxillary lateral incisors with no caries, apical fractures or resorption were collected and stored in 0.9% physiological saline. The teeth were decoronated using water cooled diamond disk and roots standardized to a length of 15 mm. A 10 K file was introduced into each canal until it appeared at the apical foramen; and, working length was established by subtracting 0.5 mm from this length. Apical third of roots were cleaned and shaped to 50 size K file using step back technique for standardization. During instrumentation, the root canals were irrigated with 3 ml of 1% NaOCl at each change of file followed by 17% EDTA solution for 1 minute for smear layer removal; and, later rinsed with saline and dried using paper points. The roots were then waterproofed externally using cyanoacrylate and the roots were set up in 1.5 mL Eppendorf tubes (Tarsons microcentrifuge tubes) embedded in heavy condensation silicone and sterilized in an autoclave at 134 °C for 15 minutes. A suspension of 50 μL of E. faecalis ATCC 29212 strand was incubated in 5 mL of trypticase soy broth (TSB) culture medium in 37 °C incubator for 24 hours. The concentration of inoculation was then adjusted for a degree of turbidity 1 according to McFarland scale which corresponds to bacterial concentration of 3 x 10 8 cells/ml, and corresponding to optic density of 550 nm. The root canals were filled with inoculation and were incubated for 21 days at 37 °C in a laminar flow chamber. All samples had a portion of inoculation transferred in 5% sheep blood Trypticase Soy Agar (TSA) plates (Hi Media M063) to check E. faecalis bacterial growth at several time periods, with a result of 100% positive. After incubation, the contaminated roots were randomly divided into 6 groups (n = 10) according to the disinfection regimen used. 10 specimens were prepared chemomechanically using the K3 system rotary files (Sybron Endo, Orange, CA) and crown apex technique. The sequence of instruments used was #40 (.04and.06 taper), #45 (0.02and 0.04 taper), and #50 (0.02taper). During chemomechanical preparation, each file was followed by irrigation with 1 ml of 5.25% NaOCl. Final irrigation was completed using 5 ml of 17% EDTA followed by 5 ml of 5.25% NaOCl, and the total irrigation time for the final irrigation sequence was 2 minutes. Intracanal irradiation was performed using a high power 908 nm diode laser (Fotona, EU) with a 200 μm fibreoptic tip and set at a power of 2.5 W. Using an oscillatory technique, the diode fiber (200μm fibreoptic tip) was introduced 1 mm short of the apex and recessed in helicoidal movements at a speed of approximately 2 mm/sec for 5 seconds, and repeated 6 times at intervals of 10 seconds between each one. 10 specimens were subjected to the same procedure as Group 1, but without diode laser irradiation. 10 specimens were prepared chemomechanically using the K3 system rotary files. The root canals were irrigated with 5 ml of 1.3% NaOCl for 5 minutes followed by 4 ml of BioPure MTAD (Dentsply, Tulsa OK) for 5 minutes, and then dried and subjected to diode laser irradiation as Group 1. 10 specimens were subjected to the same procedure as Group 3, but without laser irradiation. The root canals of 10 specimens were chemomechanically prepared using K3 rotary system, irrigated with 10 ml of 8.5% saline solution and dried with absorbent points and then subjected to diode laser irradiation as Group 1 and 3. 10 specimens without instrumentation, non irradiated and were rinsed with 10 ml of 8.5% saline solution. The apical third of the root was obtained by slicing the samples 5 mm from the apex with diamond disk and the internal diameter was calibrated to be.60-.70 mm. Dentin shavings from inner third of dentin were obtained by using Gates Glidden 1 to the apical depth followed by GG 2, 3, 4 and 5. , The preweighed shavings were then immersed in 1 ml of TSA broth in 1.5 ml Eppendorf tubes. The tubes were vibrated in Fisher Vortex equipment for 2 minutes to homogenize the samples. All samples were divided into two equal aliquots of 60 each for analysis using culture and PCR methods. For PCR analysis, dentinal shavings immersed in 1 ml of thioglycolate were incubated anaerobically at 37 °C for 24 hours. After overnight incubation, samples were centrifuged at 10,000 revolutions per minute (rpm) for 5 minutes. From this 1.0 μl of sample was taken for PCR. The reaction mix was prepared to a final volume of 20 μL and PCR was carried out in the Thermal cycler (Eppendorf Mastercycler Gradient 5331). The reaction mix contained efaA primers, Taq Deoxyribonucleic acid (DNA) polymerase, reaction Buffer, and dNTPs mix (mixture of equal amounts (10mM) of dGTP, dTTP, dATP, and dCTP in a buffer (pH 7.5). The efaA primer sequence for PCR was 5'-CCAATTGGGACAGACCCTC-3'(forward primer) and 5'CGCCTTCTGTTCCTTCTTTGGC-3'(reverse primer). PCR cycling parameters included an initial denaturation at 95 °C followed by 30 cycles of denaturation step at 95 °C for 10 minutes; A primer-annealing step at 53 °C for 1 minute; extension at 70 °C for 1 minute and a final extension step at 70 °C for 10 minutes was carried out. The products of PCR were analyzed using Gel Electrophoresis (Brovigo) technique using ethidium bromide as DNA intercalating agent. Gel was viewed using an ultraviolet (UV) transilluminator (Remi Equipments) and documented using digital closed circuit (CC) camera. Statistical analysis for CFU was done using One-way ANOVA followed by Tukey Honestly Significant Difference (HSD) test to evaluate the degree of disinfection between the groups. The degree of disinfection for experimental groups (in relation to group 6, which presented total contamination) is shown in [Figure 1]. 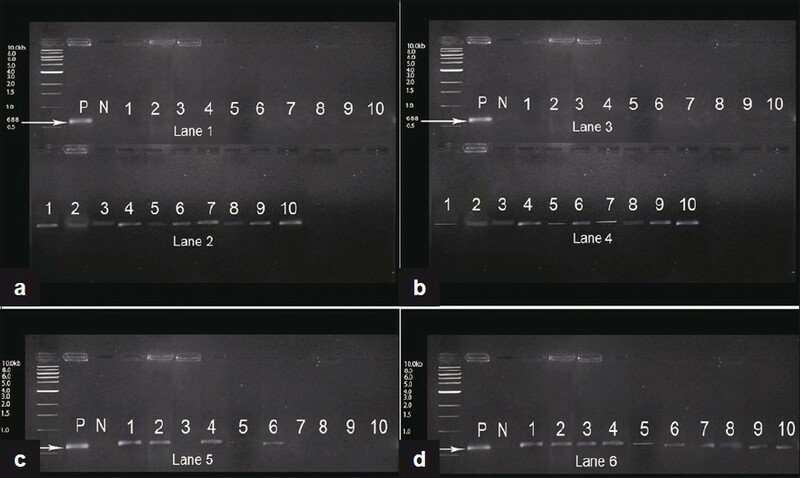 Analysis done under PCR [Figure 2] demonstrated the absence of E. faecalis in all samples of diode laser irradiated Groups 1 and 3. However, Group 5 (irrigated with saline followed by irradiation) demonstrated the presence of Enterococcus faecalis in 4 out of 10 (40%) tested samples. The non irradiated irrigant groups 2, 4 and control group demonstrated the presence of E. faecalis in all samples (100%). When 908 nm diode laser was used in conjunction with either of these two irrigation regimes (Group 1and 3), or even saline alone (Group 5), a complete elimination of E. faecalis was demonstrated when analyzed using culture methods. PCR analysis of the laser irradiated samples confirmed the absence of Enterococcus faecalis in Group1 and 3; however, Group 5-diode laser with saline demonstrated the presence of Enterococcus faecalis in 4 out 10 samples. 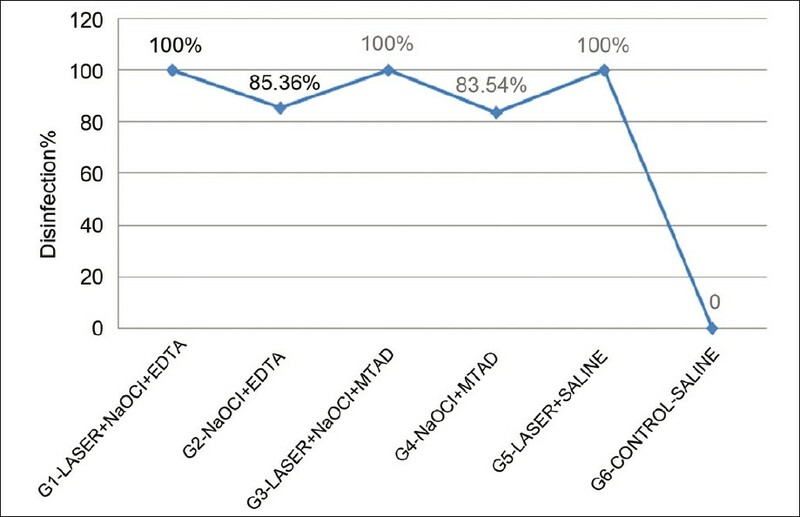 This highlights the importance of intracanal antimicrobial irrigants in improving the efficacy of laser irradiation. Recent studies indicate that in addition to the bactericidal effect, diode laser has a biostimulative effect which is of great importance in regard to healing of periapical tissues. It stimulates cell proliferation and shows an inhibiting effect on inflammation propagating enzymes like matrix metalloproteinases implicated in tissue destruction. Within the parameters of this study, it was concluded that 908 nm diode used in conjunction with conventional chemomechanical techniques aids in complete elimination of the highly resistant bacterial species of Enterococcus faecalis in the apical third of the root canal. 1. Haapasalo M, Orstavik D. in vitro infection and disinfection of dentinal tubules. J Dent Res 1987;66:1375-9. 2. George S, Kishen A, Song KP. The role of enviro nmental changes on monospecies biofilm formation on Root canal wall by Enterococcus faecalis. J Endod 2005;31:867-72. 3. Love RM. Enterococcus faecalis- mechanism for its role in endodontic failure. Int Endod J 2001;34:399-405. 4. Stuart CH, Schwartz SA, Beeson TJ, Owatz CB. Enterococcus faecalis: Its Role in root canal treatment failure and current concepts in retreatment. J Endod 2006;32:93-8. 5. Creti R, Imperi M, Bertuccini L, Fabretti F, Orefici G, Di Rosa R, et al. Survey for virulence determinants among Enterococcus faecalis isolated from different sources. J Med Microbiol 2004;53:13-20. 6. Buck RA, Eleazer PD, Staat RH, Scheetz JP. Effectiveness of three endodontic irrigants at various tubular depths in human dentin. J Endod 2001;27:206-8. 7. Siqueira JF Jr, Rôças IN, Alves FR, Santos KR. Selected endodontic pathogens in the apical third of infected root canals: A Molecular Investigation. J Endod 2004;30:638-43. 8. Silva Garcez A, Núñez SC, Lage-Marques JL, Jorge AO, Ribeiro MS. Efficiency of NaOCl and laser assisted photosensitization on the reduction of Enterococcus faecalis in vitro. Oral Surg Oral Med Oral Pathol Oral Radiol Endod 2006;102:e93-8. 9. de Souza EB, Cai S, Simionato MR, Lage-Marques JL. High-power diode laser in the disinfection in depth of the root canal dentin. Oral Surg Oral Med Oral Pathol Oral Radiol Endod 2008;106:e68-72. 10. Schoop U, Kluger W, Moritz A, Nedjelik N, Georgopoulos A, Sperr W. Bactericidal effect of different laser systems in the deep layers of dentin. Lasers Surg Med 2004;35:111-6. 11. Siqueira JF, Rocas I N. Exploiting molecular methods to explore endodontic infections: Part 1-Current molecular technologies for microbiological diagnosis. J Endod 2005;31:411-21. 12. Jha D, Guerrero A, Ngo T, Helfer A, Hasselgren G. Inability of laser and rotary instrumentation to eliminate root canal infection. J Am Dent Assoc 2006;137:67-70. 13. Gomes BP, Souza SF, Ferraz CC. Effectiveness of 2%chlorhexidine gel and calcium hydroxide against Enterococcus faecalis in bovine root dentin in vitro. Int Endod J 2003;36:267-75. 14. Siqueira JF Jr, Rôças IN, Favieri A, Lima KC. Chemomechanical Reduction of the Bacterial Population in the Root Canal after Instrumentation and Irrigation with 1%, 2.5% and 5.25% Sodium Hypochlorite. J Endod 2000;26:331-5. 15. Zehnder Matthias. Root Canal Irrigants. J Endod 2006;32:389-98. 16. Moritz A, Beer F, Goharkhay K, Schoop U. Laser Supported Root Canal Sterilization. Oral Laser Application. 1st ed. Chicago, IL: Quintessence Publishing; 2006. p. 254-77. 17. Kho P, Baumgartner JC. A Comparison of the Antimicrobial Efficacy of NaOCl / Biopure MTAD versus NaOCl/EDTA against Enterococcus faecalis. J Endod 2006;32:652-5. 18. Kreisler M, Kohnen W, Beck M. Efficacy of NaOCl/H2O2 irrigation and GaAlAs laser in decontamination of root canals in vitro. Lasers Surg Med 2003;32:189-96. 19. Molander A, Lundquist P, Papapanou PN, Dahlén G, Reit C. A protocol for polymerase chain reaction detection of Enterococcus faecalis and Enterococcus faecium from the root canal. Int Endod J 2002;35:1-6. 20. Cogulu D, Uzel A, Oncag O, Aksoy SC, Eronat C. Detection of Enterococcus faecalis in necrotic teeth root canals by culture and polymerase chain reaction methods. Eur J Dent 2007;1:216-21. 21. Zoletti GO, Siqueira JF Jr, Santos KR. Identification of Enterococcus faecalis in root- filled teeth with or without periradicular lesions by culture-dependent and independent approaches. J Endod 2006;32:722- 6. Castelo-Baz, P. and MartÃ­n-Biedma, B. and RuÃ­z-PiÃ±in, M. and Rivas-MundiÃ±a, B. and Bahillo, J. and Perez-EstÃ©vez, A. and Gude, F. and De Moor, R. and Varela-PatiÃ±o, P.